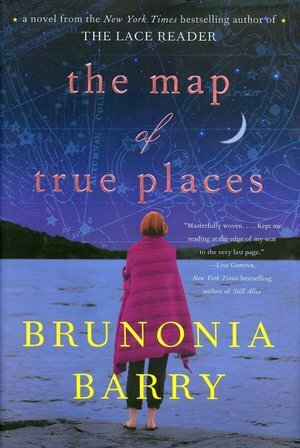 Brunonia Barry, the New York Times bestselling author of The Lace Reader, offers an emotionally compelling novel about finding your true place in the world. Born and raised in Massachusetts, Brunonia Barry studied literature and creative writing at Green Mountain college in Vermont and at the University of New Hampshire and was one of the founding members of the Portland Stage Company. While still an undergraduate at UNH, Barry spent a year living in Dublin and auditing Trinity College classes on James Joyce’s Ulysses. Barry’s love of theater led to a first job in Chicago where she ran promotional campaigns for Second City, Ivanhoe, and Studebaker theaters. After a brief stint in Manhattan, where she studied screenwriting at NYU, Barry relocated to California because she had landed an agent and had an original script optioned. Working on a variety of projects for several studios, she continued to study screenwriting and story structure with Hollywood icon Robert McKee, becoming one of the nine writers in his Development Group. Brunonia’s love for writing and storytelling has taken her all across the country but after nearly a decade in Hollywood, Barry returned to Massachusetts where, along with her husband, she co-founded an innovative company that creates award-winning word, visual and logic puzzles. In recent years, she has written books for the Beacon Street Girls, a fictional series for ‘tweens. Happily married, Barry lives with her husband and her only child that just happens to be a 12-year-old Golden Retriever named Byzantium. The Lace Reader was her first original novel. Barry is the first American Writer to win the Woman’s International Fiction Festival’s 2009 Baccante Award (for The Lace Reader.) 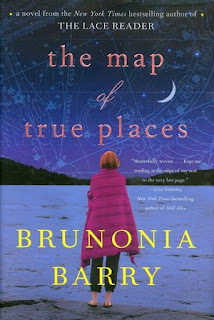 Her second novel, The Map of True Places will be published 0n May 4, 2010. I listened to this book on AudioBook first on my trip to Louisiana and then at home afterwards because I couldn't bear not to finish it having completed my driving before it was over. This was a mesmerizing book and the miles just melted away as the story progressed. The narrator was wonderful on this one, but the story was most perfect. It ranks as one of the best stories I've listened to on tape of all time. I loved it. Made me wish I'd just read the book! You can see the summary above, and here is a review below by Kirkus. A novice psychotherapist finds unsettling parallels between a patient's suicide and her mother's history, in Barry's second (The Lace Reader, 2008). Hepzibah (ZeeZee grew up in the historic Salem home that was once Purveyance's domestic prison.) Now a doctoral candidate in Boston, Zee sees aspects of Maureen in her bipolar patient Lilly, a suburban homemaker. Lilly tells her of Adam, a carpenter, whom she loves desperately, but who now appears to be stalking them both-Zee's seen him lurking outside her office. With adjusted meds, Lilly improves, but then leaps to her death from a bridge during rush hour. At Lilly's funeral, Zee spots a man she recognizes from TV news as a distraught eyewitness to Lilly's death. More personal woes intrude. Finch's Parkinson's disease is worsening, he's now alienated from Melville (his partner since Maureen's death) and requires full-time care. Zee returns to Salem, and this town of Wicca practitioners, pirate re-enactors and tall ships, like Friendship, a replica of the vessel on which Purveyance fled, reclaims her. Hawk, the stricken eyewitness, is now crewing on the Friendship and, when Zee enrolls in his celestial navigation class, she's ineffably drawn to him. Soon the pair are making love in Maureen's room, beneath the same widow's walk on which the storied lovers once trysted. Although marred by unnecessary "come-to-realize" moments, this woman-in-jeopardy thriller retooled with gothic elements-shifting identities, secrets and portents, a deserted cottage and a missing suicide note-manages to transcend its component cliches. A highly readable sophomore effort. Reading group guide available online. I loved the depth of character study Ms Barry goes into with Zee and her parents. Maureen is especially compelling to me for some reason...perhaps because she's such a tragic figure and because her love of fairytales and the ghostly appeals to the gothic in me. Zee keeps the story alive as she searches for herself and the meaning of her roots. And I love the relationship between her father and his gay lover, "Hawthore" and "Melville" are just brilliant. Melville's story is especially poignant. Zee's dad (Hawthorne's) gift of Yeats book of poems is a section of the story that will tear your heart out. This is a book on tape that will keep you happily engaged for several days, and I'm sure the same could be said for the book. I love Brunonia Barry's style and her setting of Salem, MA. Made me very homesick for Massachusetts. I've heard Barry is a fabulous author. I'm anxious to read one of her books.